Do you only have a limited space to wash and dry your clothes? Don’t worry, it’s time to be creative and bring the best in what you have, instead of sulking every time laundry day comes. It is surely hard enough as it is without you being sulky. 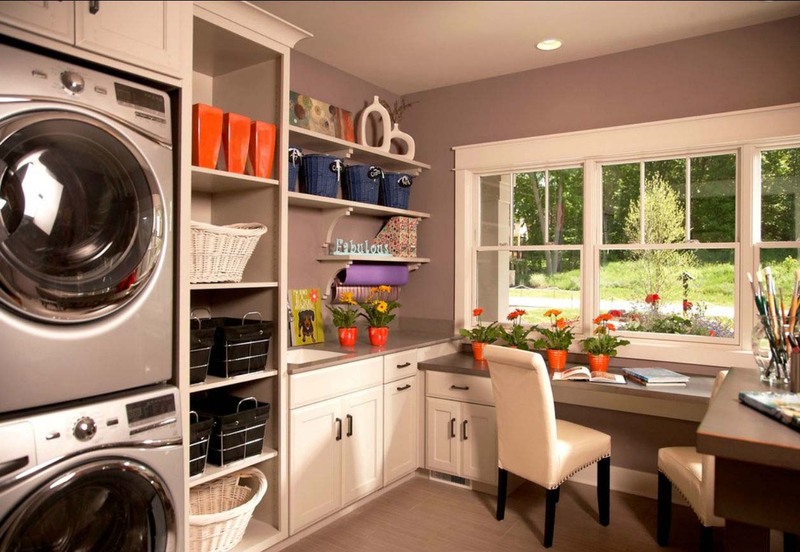 In today’s article, you are about to find 10 small laundry room ideas to help you put away the need of large space. Check them out! Solution number one is to merge the laundry space with another room. This picture tells you the best example. Seen in it how washing machine and craft supplies agree to be in harmony inside one room. You could gain a lot of benefit from it. Boldly say, here are some of them. During your boring times waiting for the washing machine to finish the job, you could do some of your hobby. Besides, remember how you grumble about not having time to do another craft? Well, you have it now! The craft table can be functioned also as your folding station. Another example of merging two rooms is here. While the previous room shows the collaboration of washing machine and craft supplies, this one displays a view of laundry and study room combination. The benefit is pretty much similar with point number one, which you can go and do more than one job at a time. However, the beauty of this incorporated room is not only that. Being toned in neutral shades could make the room nuance goes dull. Yet, such worry won’t ever happen thanks to the pops of orange and blue over the desk study and on the shelf. It is also lucrative to have a direct nice view right in front of the room. 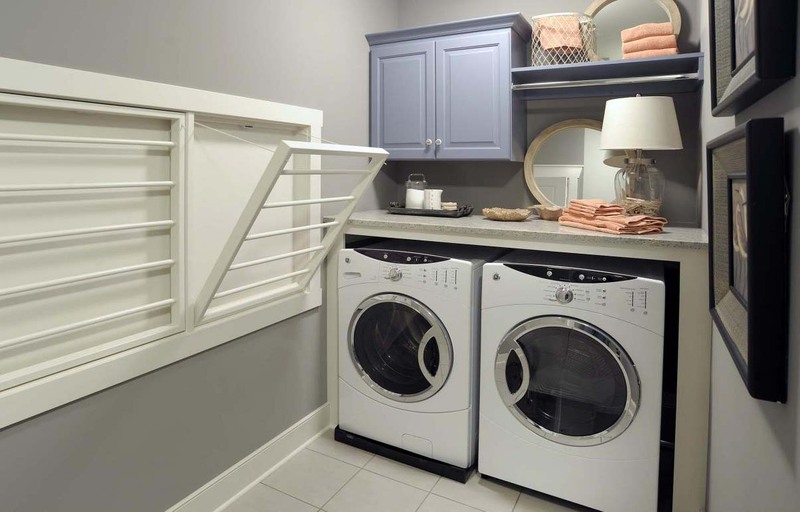 In order to save some valuable space in your laundry room, consider having your washer and dryer concealed as exemplified here. Don’t worry about the machine’s capability to hold the other above it. As they are designated to be stackable, carrying one on top of the other will be their innate ability. The stackable pair also eases you laundry job. As they are in the same place, you wouldn’t have to go back and forth from the washer to the drier and vice versa. The fact that they are actually out of sight when not in use cuts you off of some fussy problem. If you don’t have a stackable washer and dryer, the best you could do is to line them up side by side. 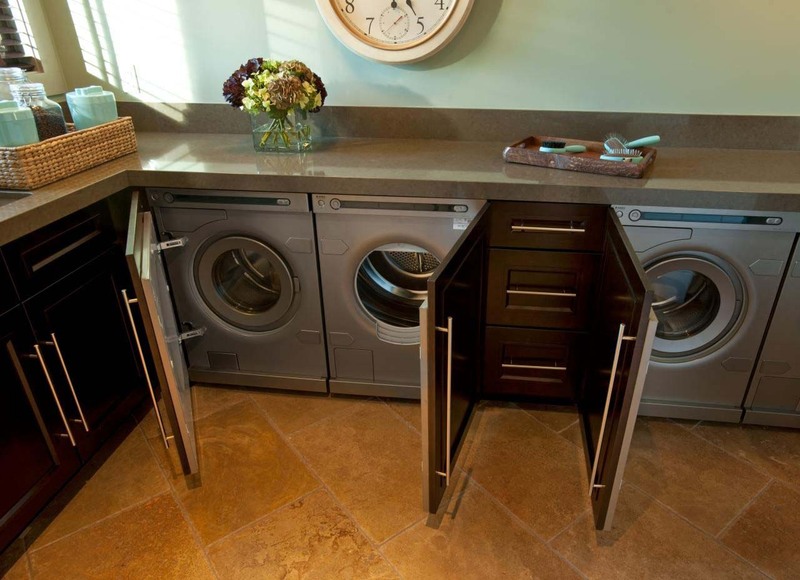 The picture shows a customized cabinetry and its ability to store some pairs of washing machines vertically. It’s a good option to have in order to save some floor space and make use the wasted area. Choosing a palette of neutral color as the main tone will be your next solution. It comes in relation of simplicity. 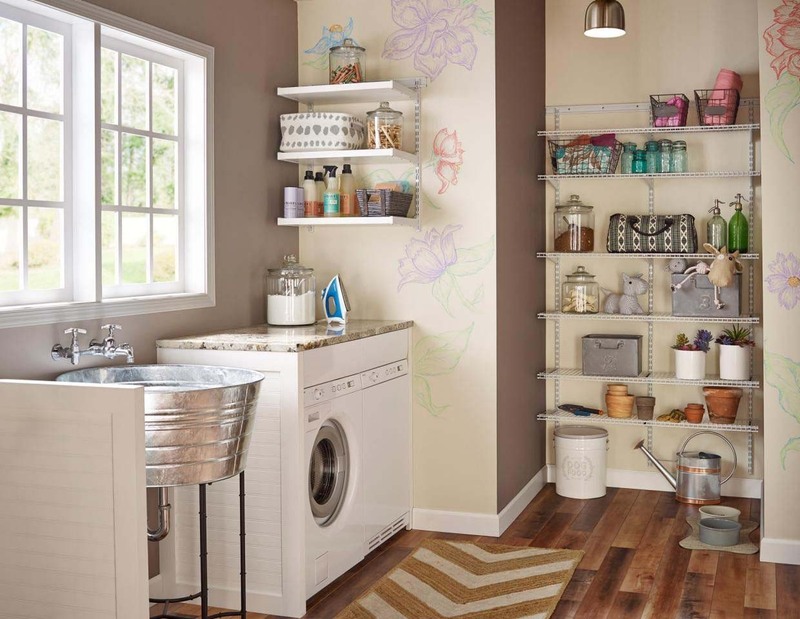 You won’t want some fuss created by the other hues in your limited laundry space, will you? Besides, neutral colors are also efficacious in giving the effect of larger room. As for this room, the neutral tones appear in the shades of white as the main color and brown as accents. There is some continuation, too, with baskets lying and hanging here and there. In this black and white laundry room, where white takes the role of main color and black becomes the accents, a pop of yellow is beyond expectation. While a palette of neutral colors simplifies your small laundry space, a pop of other bright color helps in making the room a little bit cheerful. As you already see, patterned black items are all over the place and it’s lovely. I guess you could interpret ‘a palette of neutral colors’ this way. Black and white laundry room is one, while grey and white is the other. 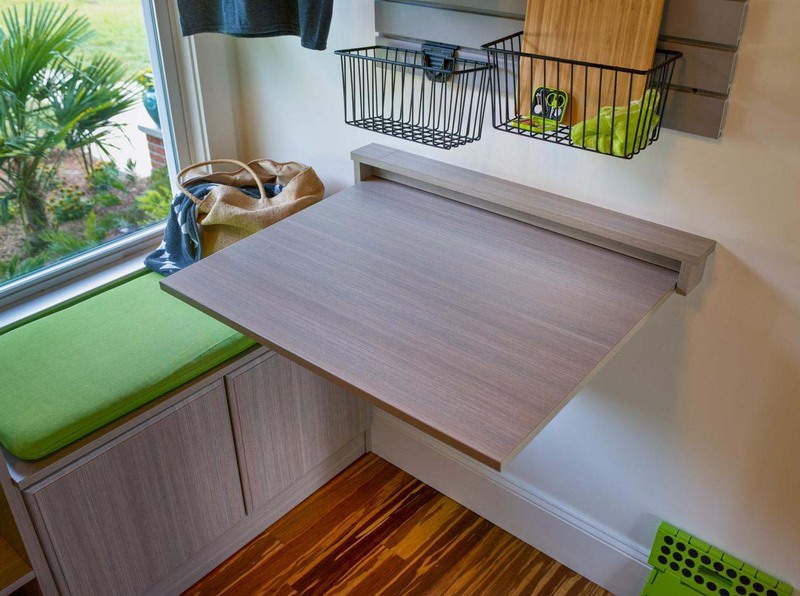 This compact neutral toned laundry space needs a little bit of surprise, and so it has from the small mounted cabinet and a stack of towels over the counter. 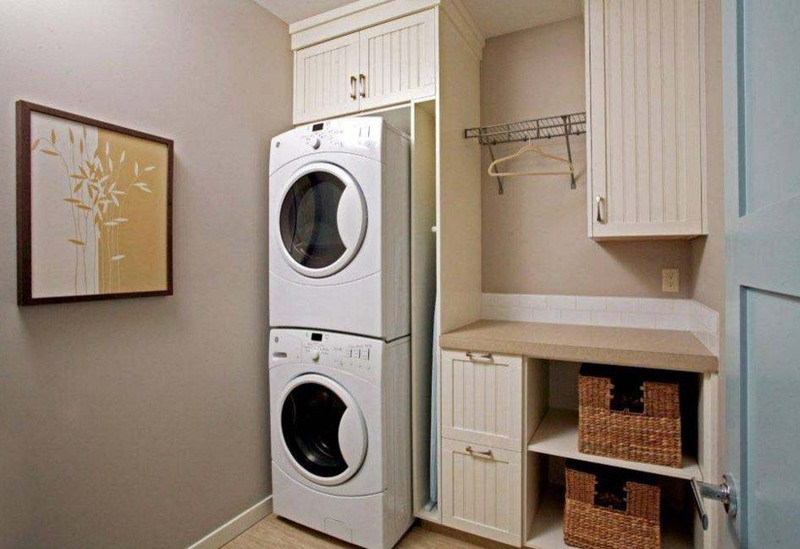 Though limited, this laundry space has everything. To list the completion, it goes as follows. Mounted cabinet to keep the supplies in range. Depart from a similar principal with hiding the machines to save some space, utilizing wasted areas is your next solution. 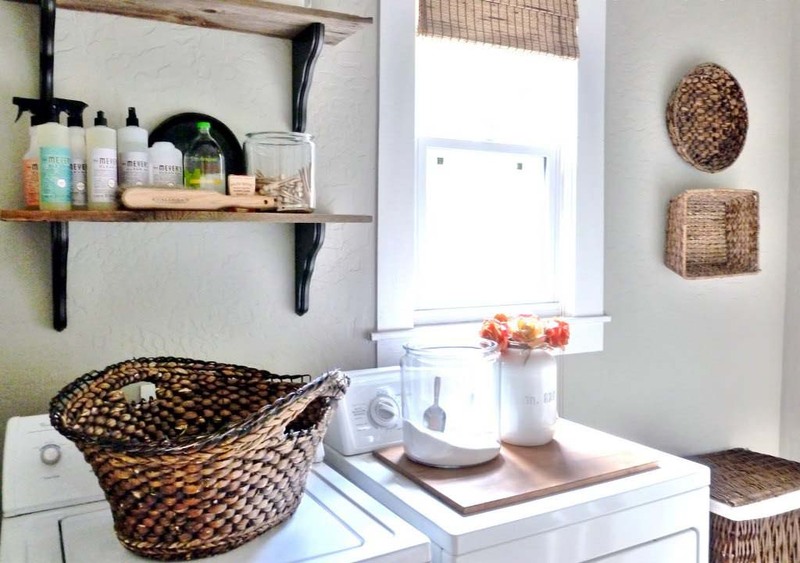 The first example is to make the best of bare wall space by creating storages to organize some laundry supplies. Adjustable shelving over the counter and off the floor would do. It aids you in keeping the supplies within your reach. 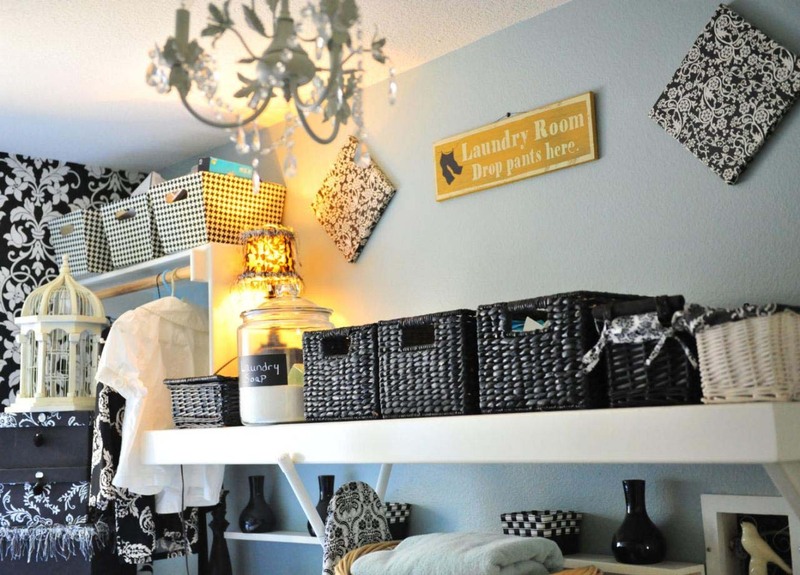 However limited your laundry room, having some folding station is still a must. This station prevents you from putting away your dried laundries carelessly all over the place. Thus, it also helps you to keep the house neat from any possible laundry disorder. Consider installing a small piece of board onto the bare wall to have a useful station. Your last solution of small laundry room is to have some pedestal drawers under the counter like this picture shows. Or rather, the usual people have is drawers under the machines. Either way comes in handy for you in the end, so it goes the same. 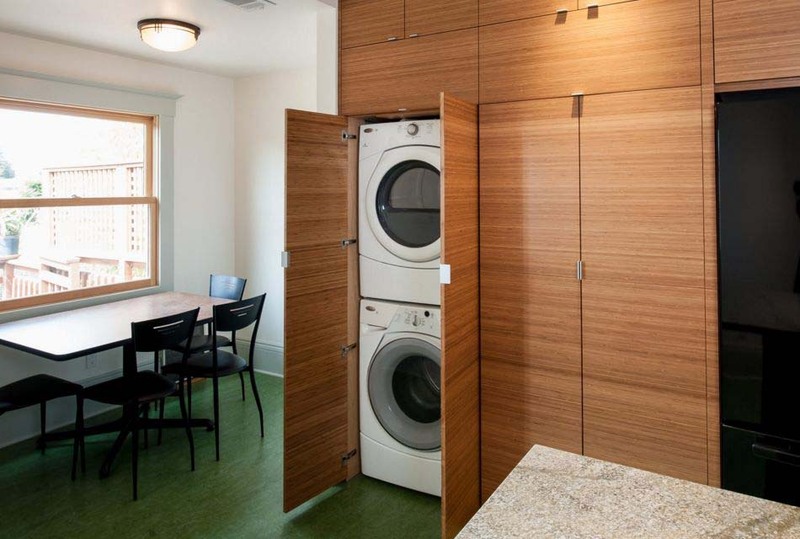 Looking at the full scale image, nothing could beat a compact laundry room in terms of practicality. As it makes the best use of vacant space, some area is saved. And it what we want to reach from the very beginning, don’t we? There. Now you know that you could have some fun with your limited laundry space. 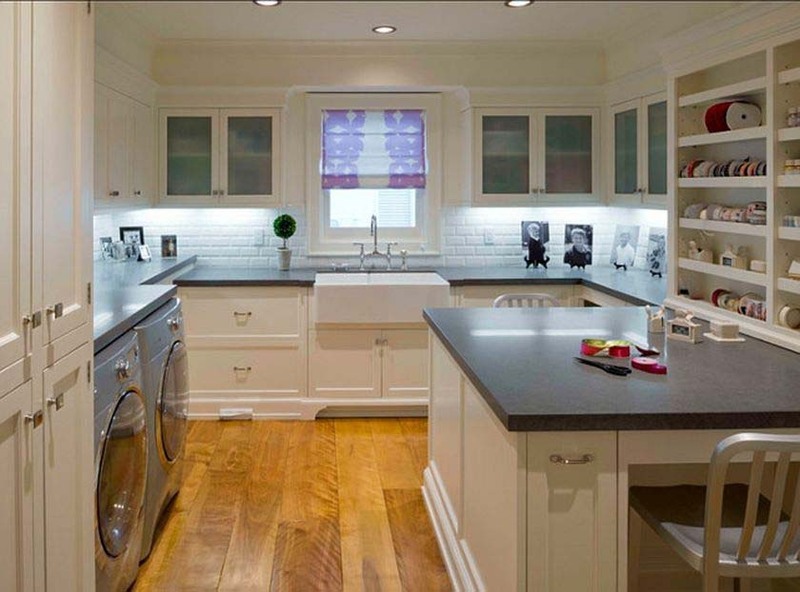 Thank you for scanning the whole small laundry room ideas in this article. Hope you find it useful. Have a great day!